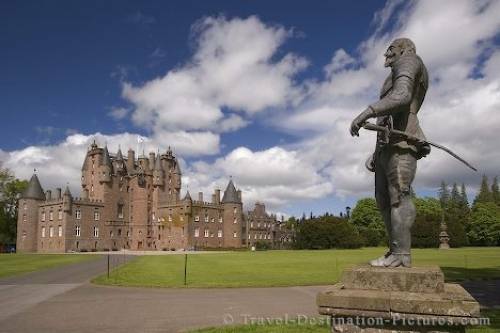 A statue stands proud in the ground of the Glamis Castle in the Scottish Highlands, Europe. Glamis Castle in the southern parts of the Scottish highlands is one of the castles Shakespeare used in his drama Macbeth. Here it is said that Duncan killed Mac and Cador. beth, the Than of Glamis and Cawdor. Today the pretty castle can be visited and viewed from the inside as well as from the nice park area which surrounds the castle itself. Photo of a statue in the Glamis Castle grounds in Scotland, Europe.